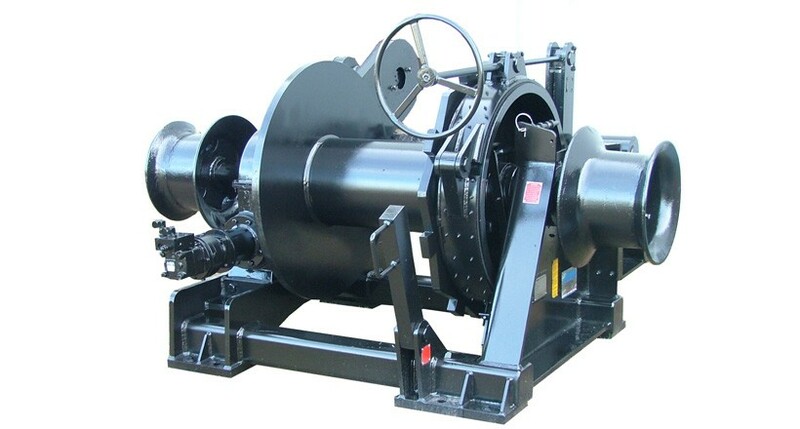 The marine hydraulic winch is mainly designed for big load rating, usually from 10 ton at least to 5000 ton. Bring into Dutch’s advanced technology, Ellsen’s marine hydraulic winch holds so many advantages, such as outstanding appearance, reasonable design and better performance. Due to high safety and big load rating, the marine hydraulic winch is widely used to rise or fall, as well as drag the goods in oceaneering, water conservancy project and harbor and other place. There are mainly two kinds of marine hydraulic winch; one is the hydraulic capstan winch, and the other the hydraulic anchor winch. Besides these basic kinds of hydraulic winch, we are capable to custom all type of particular hydraulic winch for some certain working environment. The hydraulic motor in our hydraulic marine winch enjoys high mechanical efficiency and big starting torque. We can offer different distributor according to certain working condition, as well as design valves on the motor oil distributors on the basis of customer’s requirements. Simple and reasonable structure, enough strength and rigidity. Such as we can put the behavioral valves including balance valve, overload valve and detent into drum, and design the coiling block and back shaft under the guidance of mechanics. This hydraulic marine winch not only holds compact structure, small volume, light weight, and outstanding appearance in structure, but also owns high safety and work efficiency, great stability, small voice and reliable operation in performance. Treats oil as the working media, Ellsen’s marine hydraulic winch mainly transmit motion though the change of sealed volume, and transfer motivation by the pressure from the inside of oil. The entire work cycle is composed by three steps. First is the power section, which transfers the mechanical energy from original motor into hydraulic energy that belongs to the oil. This is particular true in the job of oil hydraulic pump. Second is the operative part, which is in charge of converting the oil pressure brought by fluid pump to mechanical energy to drive several operating mechanism. For instance, the hydraulic cylinder and hydraulic motor does. Third is control section, which mainly used to control and adjusts the pressure, traffic and flow direction from oil. Just as the pressure control valve, flow and direction control valve. Finally, the important part to connect with the other three aspects, making them form a complete system, mainly takes charge of storing oil, filtration, measure and seal. Just like the functions made by these components, which includes pipeline, contact, fuel tank, filter, energy accumulator, sealing element and control instrument. As we all know, the pressure that we put on any point in a specified volume of liquid will convey to every direction in an equal size. Just as the same reason, when we use multiple hydraulic cylinders simultaneously, each hydraulic cylinder will pull or drag the goods in their own speed, and the speed depends on the pressure from travelling load. Under the same range of carrying capacity of hydraulic cylinder, the smallest load will move first and the biggest load last. In order to make the hydraulic cylinder synchronous movement, making the load be rise in any point at a same speed, the control valve must be used in system. In a word, the working principle of marine hydraulic winch is mainly transfer impetus though the pressure of liquid, which also can be said that utilize the execute component transform the liquid’s pressure into mechanical energy to drive the other element to work smoothly. When the hydraulic system works, operator should control and adjust the pressure, traffic and direction of oil pressure to satisfy the requirement of work parts in force, speed and direction. In hydraulic system, the power plant not only offers the pressure to the whole system, but also transfers the mechanical energy output by motor into pressure energy of oil, thus push the entire system to work. The execute component mainly includes hydraulic cylinder and hydraulic motor, which can convert the pressure energy of oil into mechanical energy to force the work piece to move normal. All kinds of valves contain pressure valve, flow valve and direction valve belong to control and adjust apparatus, which is mainly used to control the liquid pressure, speed and direction in hydraulic system, ensuring the execute components complete its prospective work motion in time. The auxiliary device mainly refers to all kinds of pipe joint, pipeline, fuel tank, filter and manometer, which play a part of connection, oil storage, filter, store pressure energy and measure oil pressure, to ensure the hydraulic system will work reliably, stably and enduringly. In the entire hydraulic system, oil also can be called working medium to bear and transfer pressure. Strong technology support. during more than one century’s development, Ellsen company has been a leader in crane industry, owned 6 factories and more than 2000 employees, among which includes almost 800 engineers that provide professional and specific knowledge for our customers anytime anywhere. it‘s convenient for our customers to install and maintenance their gantry crane.